Recognised Tommy Cornell from the TEW games as your avatar too. October has been a busy month for us, although only two of our seven games have been in the league! We are through to the last sixteen of the MFL League cup after overcoming AFC Wulfunians, although we face a replay with Liversedge in the FA Vase after only managing a 1-1 draw with the North East Counties League club. We are out of the Birmingham Senior cup after being knocked out by Boldmere St Michaels, this is the second time the Mikes have got the better of us this season after a 2-1 reverse in the MFL at the beginning of September, they become the first club to beat us twice. November looks as if it will be a punishing month on the players legs with at least eight fixtures scheduled, more if we advance in the FA Vase so I'm going to have to manage training carefully, everyone on a light schedule I think as well as rotating the starting XI strategically for each game. Complaining about the weather one way or another is the defining aspect of Northern European life. This, it's impolite to go to a shop counter and not open the conversation with a full recap of the days weather forecast. I do love some of the team names that pop up in saves like this. Quorn, for example, a team/town of vegetarians? Hardly, It's home to one of the biggest fox hunts in Britain, in fact it is depicted on the club badge. It's not far from where I live. Here is a random (useless) fact: We've a Dunkirk (Road) in Northern Ireland, located in Waringstown, Craigavon. Derby and Carlisle's penalty shootout sounded like a bit of an epic, finished 14-13. Reminds me of some of the ridiculous ones I've had on FM that have gone on for two rotations before the goalkeeper scores the winner with his second. September has been a mixed bag of results with us achieving two wins, two draws and two defeats this month. Throwing away the lead and going on to lose against North Birmingham neighbours Boldmere was frustrating, however not as frustrating as having the exact same thing happen in the very next game against Coventry Sphinx as well. I have to find a way to improve my teams ability to handle the pressure of protecting a lead in the closing stages. 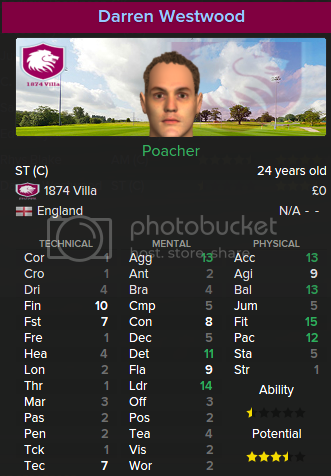 Zach was unattached following his release from Southern Premier League side Bedford, he immediatly made us look a little more secure at the back, unlike any of my other centre backs he has a bit of pace which is what was missing in my opinion, I don't think it is a coincidence that since his arrival we are on a four game unbeaten streak. The matches keep coming thick and fast in October, seven games in all, three of them cup ties as we take on Blaby & Whetstone in the FA Vase second qualifying round before a MFL League cup game with Wolverhampton based AFC Wulfunians and finally Birmingham senior cup tie with Boldmere St Michaels. It would be nice to have a good run in at least one of those competitions so I'll be fielding a strong side in each fixture. It was a major disappointment to lose our inaugural game at home to Sporting Khalsa, we found ourselves 3-0 down at half time as my defence made mistake after mistake, we staged a spirited fightback in the second half, scoring twice through Darren Westwood and Jerome Murdoch but were unable to complete the turnaround, the 3-2 scoreline should not fool you into thinking our defence improved in the second half, they were just as bad, only inadequate finishing and a few decent saves by goalkeeper Sam Moore prevented Khalsa from putting the game to bed and registering a much bigger victory. This game confirmed the fears I alluded to in the previous post regarding our frail back four, the two centre backs in particular struggle with any forward who has pace, this is something that needs addressing sooner rather than later. Our game against Stafford based Brocton looked to be following the same trajectory as the Khalsa fixture as we found ourselves 2-0 down at the break and once again struggling to contain the oppositions forwards. however a tactical reshuffle and giving my players a kick up the backside at half time worked wonders as we got fought back via an own goal before Darren Westwood scored in the 74th minute to earn 1874 our very first point. We didn't have to wait long to bag three more points as Rocester visited the Alexander, Westwood latched onto a hopeful ball over the top from Lee Hendrie to fire us into a seventh minute lead, the Romans however pegged us back ten minutes later as our inability to deal with pace was again exposed and I began to fear a capitulation. Those fears were mercifully to be proved unfounded as former Walsall winger Jake Jones restored our lead after cutting in from the left, substitute Neville Thompson clinched our historic first win when he head home with nine minutes left on the clock. A 1-1 draw away at league leaders Quorn wasn't a terrible result, however is was a little frustrating to have lost the lead, still that result sees us into the top half of the MFL table which is above and beyond what is expected of us this season (avoid relegation battle) and I would be quite happy to finish mid-table this year, building for a serious push to achieve my objective of promotion within three years. Darren Westwood has been in great from in front of goal, four strikes in four matches for the local lad who is second in the MFL scoring charts at the moment behind Westfields's Ekene Amadi who is on five. Thanks mate, yeah, horrible situation your club is in currently. 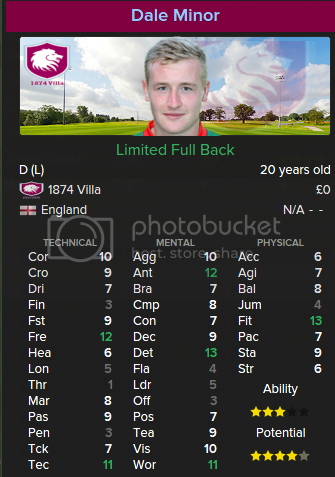 Sam Moore was chosen as my number one after he successfully trialled for us in the friendlies, he is a London lad who began his career as a trainee at Brentford but failed to make the grade in the football league, he has most recently completed three years playing for Loughborough University. Of all the areas of my team, it is the backline that concerns me most of all, it is cobbled together rather haphazardly after I blew the bulk of my wage budget on midfield and attack, time will tell if they will prove me wrong but I suspect changes will occur back their throughout the season. Joe is the most exciting player in the defensive department, the former Curzon Ashton man is capable of getting forward, which I will be telling him to do in order to unsettle opposition defences on the overlap. Easily the strongest part of the team, Lee Hendrie is a former Villa star with an England cap to his name who has been floating around the local non-league scene for the best part of a decade now. At 38 he's well past his best physically, although he can still pick a pass which is more than can be said for the majority of midfielders at this level. Stephen Cooke is another former Villa man, though he never really established himself at Villa Park, a handful of appearances under David O'Leary in the early 00's was all he managed before moving on to Bournemouth and later Torquay before dropping off the radar into non-league football where he has played ever since, spending the last five years with Walsall based Pelsall Villa. I'm not too sure about this department, I was quite happy with it until I lost half of it for the first month of the season in the same game! I clearly could do with adding some reinforcements here, however when everyone is fit I can see us banging in the goals. I lured Jerome from Coventry Sphinx, though he is no stranger to the Midlands non-league scene after spells with Tamworth, Barwell and Coalville Town where he was a part of two promotions as well as playing in the FA Vase final at Wembley. As expected we lost to Northampton who are five divisions above us on the pyramid, though it was a close run thing with the cobblers only securing the win late on as we put them under plenty of pressure. All the other games were against other local non-league sides, I saw some pretty decent football, my talented midfield keeps possession quite nicely and I will be looking to utilise a sort passing game to capitalise on that. So far I have been lining up with a simple 442, I'll refine my tactics as the season wears on but for now we'll concentrate on doing the basics right. 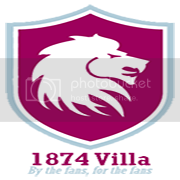 The club shall be, and shall forever remain property of the 1874 Villa supporters trust, a board of trustees shall be democratically elected every two years from amongst club members to serve in the duties of managing the club's non sporting activities. The club shall endeavour to spend within it's means and remain self sufficient financially and no action shall be taken by administrative or coaching staff to incur debt at the club. It is the intention of the club to acquire or build a permanent home stadium for the club, this shall be done with the limits of the Northern ward of Birmingham and shall only occur when the club is in a financial position to do so without use of loans. Tickets and merchandise shall remain at an affordable price for supporters. 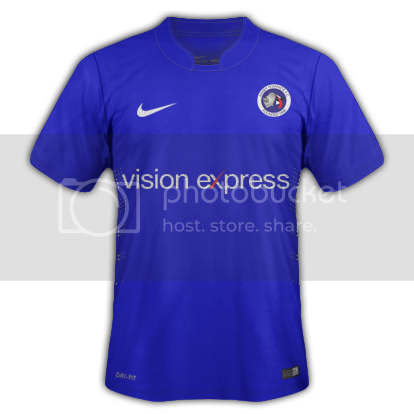 The club home kit will change no more frequently than once every two seasons. Where possible the club will engage with and recruit from the local area. once a youth structure has been established the coaching staff will be expected to prioritise developing young local talent as opposed to buying from abroad. Midland Football League Premier Division: 22 teams, playing each other twice, there are no play-off's at this level, only the team finishing first is promoted and the bottom two are relegated. FA Vase: We are not eligible for the FA Cup as all entrants must have been playing for at least three years, however we will be participating in the FA Vase, which consists of over 500 teams from step five and below. There are two qualifying rounds before eight proper rounds, culminating in a Wembley final. Midland Football League Cup: Open to all teams in the MFL, there are six single legged knockout rounds. Birmingham Senior Challenge Cup: 32 teams from across the Birmingham metropolitan area, the lower division side always plays at home with the final set for St. Andrews, home of the hated Birmingham City next May. Looks a grand stadium for a nonleague side, though that track is a proper downer. In any case; this ground is only supposed to be temporary, part of my long term ambitions for the club is to build a stadium of our own, just like FCUM who moved into their own purpose built Broadhurst stadium last year. 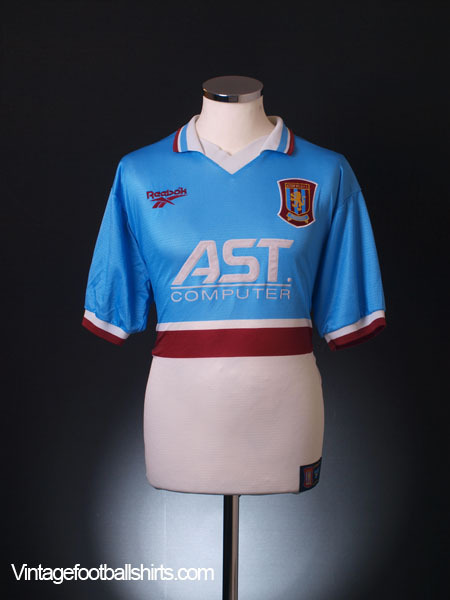 Formed in 2015, 1874 Villa FC are a brand new club, established by a faction of Aston Villa supporters who had become disillusioned with the direction of the club under the ownership of American billionaire Randy Lerner, Believing the club to be stagnant and regressing, and angered by Lerner's apparent loss of interest and refusal to sell the club unless a potential buyer met what was perceived to be an unrealistic valuation of the club, turning away potential interest. The group was further angered by year on year price hikes on tickets despite the club performing well below expectation in the league and when Lerner refused to attend a meeting requested by supporters to discuss the future of the club, the decision was taken to form a breakaway club. 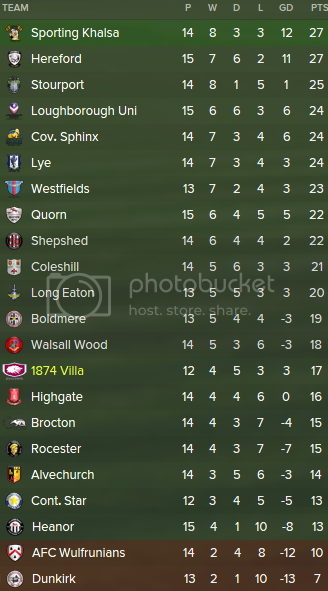 Established under the name 1874 Villa (the year Aston Villa was formed) The 1874 supporters trust successfully applied for a place in the Midland Premier League at step five of the English non-league system where it will compete in the club's inaugural campaign in 2015/16, the motto 'By the fans, For the fans' is adopted as the club constitution is written, stating that 1874 Villa will forever remain in the hands of it's supporters with the board democratically elected by club members every two years. 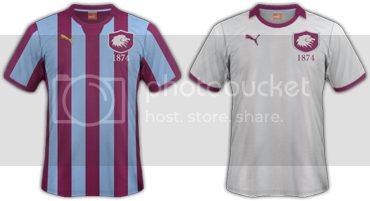 Continuing the Villa tradition, the club colours are claret and blue, however instead of the classic claret kit with blue sleeves the decision is taken to sport a striped kit to help 1874 build an identity, separate to that of Aston Villa. The nickname 'The Rebels' is also adopted to mark the secession. 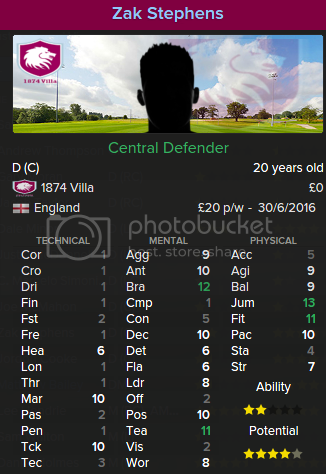 The supporters trust appoint 28 year old, lifelong Villa fan Rick Beale as the club's first manager, a surprise appointment given more experienced non-league managers had expressed an interest, however the task of building a squad capable of finishing in the upper half of the Midland Premier League from scratch now falls to him, time will tell if this turns our to be a cost cutting masterstroke or a abysmal mistake on the trusts part. The new club initially planned to share a ground with Northern league side Sutton Coldfield Town, the largest district of Birmingham, and home to a large percentage of Villa's fan base, however Sutton already shared their ground with Romulus FC, similar circumstances prevented a deal with Boldmere St. Michaels. potential moves outside of Birmingham to Tamworth's Lamb ground and Walsall's Bescot Stadium were voted against by board members fearing the effect of removing the club from the area might have on the potential fanbase. 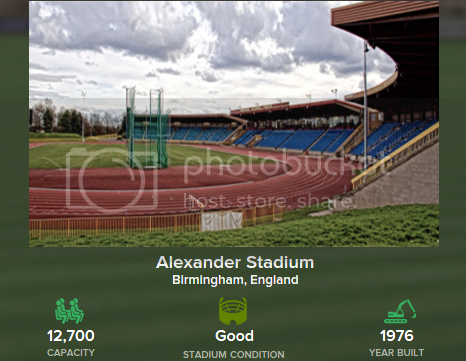 Finally a deal was struck with Birmingham City council to enable 1874 to be able to play their home games at the 12,700 capacity Alexander Stadium, home of the Birchfield Harriers athletics team and situated only a mile from Villa Park. The deal is believed to cost 1874 in the region of £18,000 per annum, a substantially reduced price for such a facility, however still expensive to a newly established club in the ninth tier of the football pyramid and some question the wisdom of the tenancy, further still critics point out the distance between the pitch and the the stands is significant due to the Olympic standard running track in between, making it hard to establish much of an atmosphere and potentially affecting attendances. Many believe the club would be wise to seek a move away from the stadium as soon as possible. Apparently former Villa striker Dalien Atkinson has died after being tasered by a police officer. If you download some extra countries I have had some enjoyable saves using the Baltic nations. They would be a good challenge but not so far off that it would be impossible to achieve anything with them. I am cautiously optimistic, I think under him we should get a more settled system at least which will surely be of some benefit. I have to babysit a 2 year old today and have no idea what things we can do that won't give her sunstroke in this weather. I could take her to the pub and hustle her at pool but she doesn't have any money. Keeps my 14 month old happy for hours just splashing in the toddler pool. Anybody else willing Ronaldo to drop the trophy off that balcony? 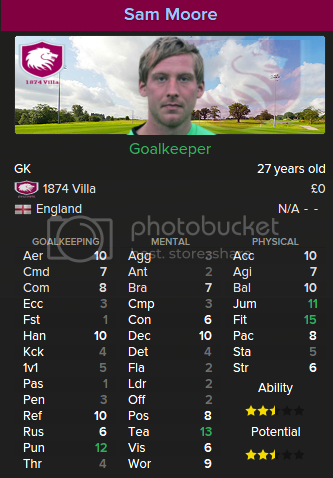 I imagine either Brad Guzan or Mark Bunn are on the move then. Guzan got a lot of stick last season for some silly mistakes, though to be fair he kept us up the season before, any keeper in the world would struggle with the standard of defending we had last season. A crowd welcoming them at the airport would be well deserved but an open top bus is ridiculous. 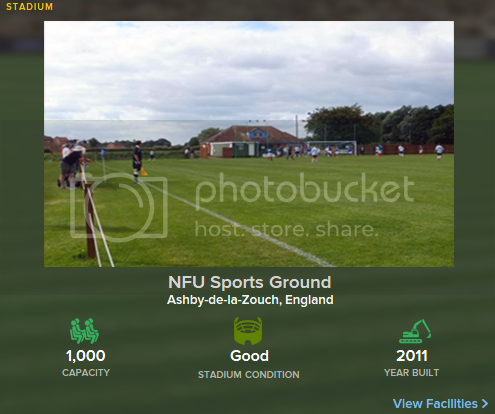 We play at the NFU sports ground, referred to by locals as Upper Packington Road. 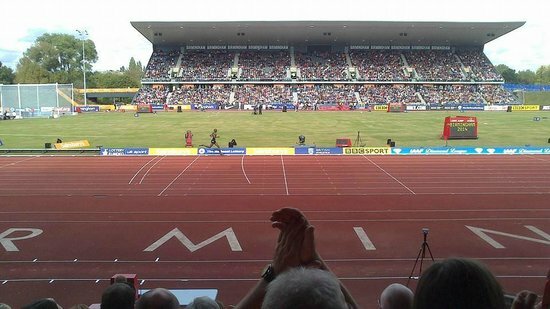 build as recently as 2011, It has a small seated stand of around fifty seats and a long terrace running opposite. The ground has multiple pitches for training and reserve team games. The youth team plays at the club's former home, Hood Park leisure centre. We have a host of local rivals within a couple of league levels of ourselves, arch rivals are Coalville Town as there is only about three miles between the two towns. 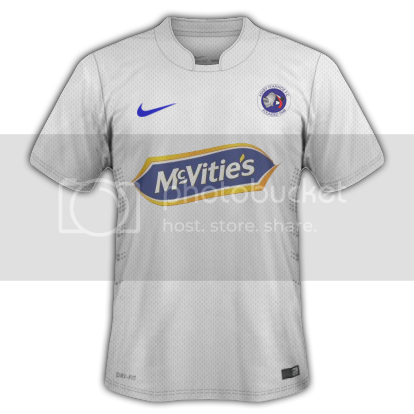 Here's our kits, the home one is true to life, I couldn't find a picture of the away kit and I've never followed Ivanhoe away in real life so I just made that one up, using McVities (who are based in the town) as a sponsor. 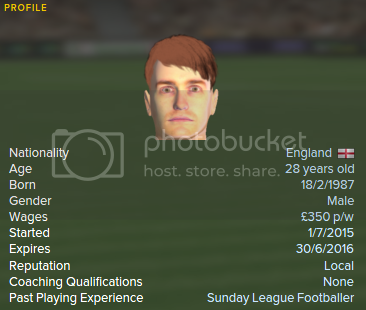 To add some more local flavour to the story, striker Danny Quinn is my barber in real life. A warm greeting to you all, to this; my personal quest for greatness within the cut-throat world of football management, starting at the base camp of a mountain, the peak scarcely visible, looming at dizzying heights above me. I shall be taking my first steps on the trail to immortality with my hometown team, Ashby Ivanhoe FC. 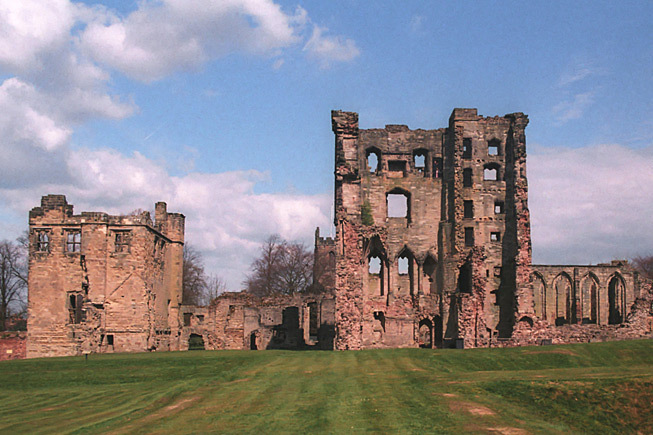 Based in the Leicestershire market town of Ashby-de-la-Zouch which recently appeared on a poll of ‘Britain’s hidden gems’ compiled by the National Express coach company. Ivanhoe take their name from the Sir Walter Scott novel of the same name which is partially set within the town and it’s ancient castle ruins which also gave the club it’s nickname ‘The Knights’. 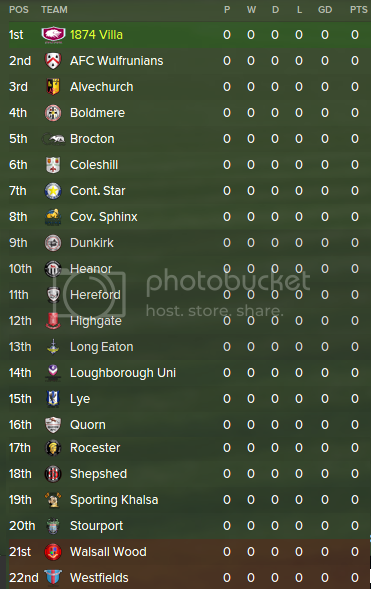 I am using the EEE (England enhanced & expanded) file available from FMUpdates, which enables all divisions down to the fifth step of non-league football to be playable as well as adding numerous regional cup competitions. I highly recommend this expansion to anyone who enjoys non-league footy. 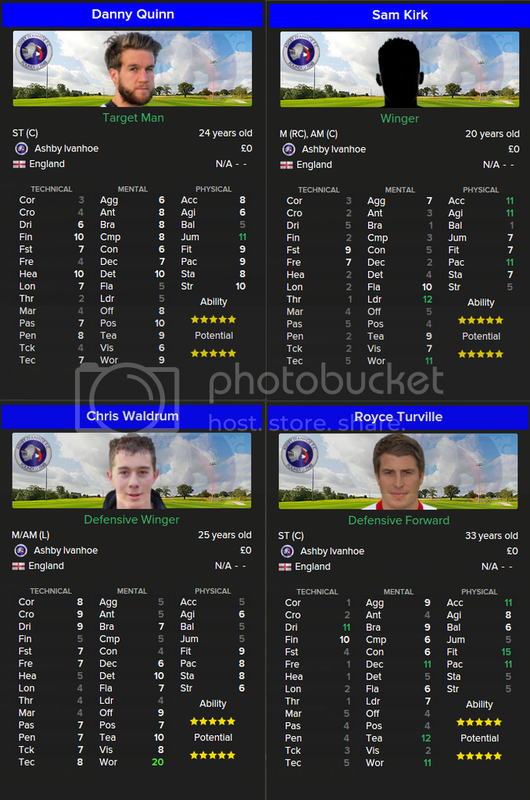 I have used the editor in conjunction with this file to swap Ashby from the East Midlands Counties League in step six into the Midlands Premier division at the expense of Continental star who finished last in real life last season. 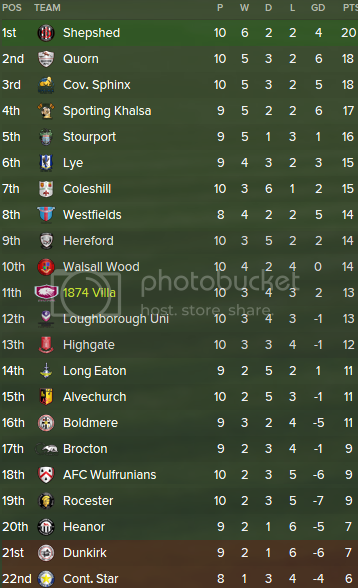 (Ashby only narrowly missed out on promotion, finishing third, so it is not an unrealistic scenario in any case.) I’ve also added various details which hadn’t been filled out fully such as ground information, rival clubs, supporter profiles and sponsorship money, all this I have done accurately to the best of my knowledge, with financial information I have used other clubs at the same level and with similar reputation as a guideline, suffice to say there will be no multi-million pound signings in the heart of the National Forest for some time. 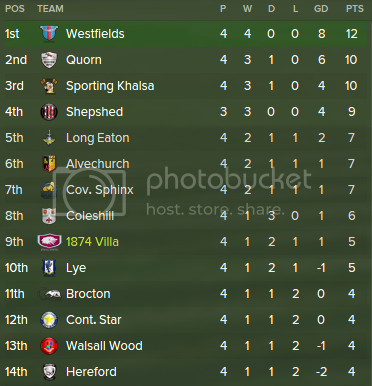 As I said earlier, Ashby is only intended to be the starting point of my soon to be glorious career, I have no illusions of one day winning the Premier league with them or anything like that, though I do hope I can bring at least some success to my hometown. Time will tell. This thread should be renamed to the personal injury thread. Anybody watch All the way on Sky Atlantic the other night? It is a made for TV film depicting the first year of president Lyndon B Johnson's time in office immediately following the JFK assassination. Bryan Cranston from Breaking bad is brilliant in it. Home kit is same as ever. The away one looks like a re-make of our 1998 kit though. Just heard on the radio we might be reinstated to the Euros, Iceland fielded an ineligible player against us, apparently they are meeting now to discuss the situation. I can't find anything about it elsewhere though so it's possible they just picked up on a rumour and reported it as fact. Edit: Sadly the presenter admitted it was a wind-up after having over 1000 emails, texts and tweets in the space of twenty minutes. Fell for that one. Boris doesn't want to captain the sinking ship that he punched a giant hole in the side of. strange that. I'm trying to find some insiration thinking maybe an african career? I've played in Morocco and Egypt which are fun as there is a fair amount of cash to spend there, making winning the African champions league a real possibility if that's your aim. 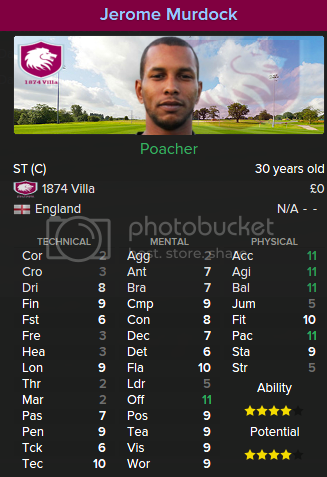 I also did a save which took in Cameroon and Ghana in West Africa on FM14, they get some pretty good regent despite the leagues being generally quite poor standards and you could well get a job at a Champions league club right from the start due to the relatively low reputations there. Aside from the signing of Tommy Elphick we have been concerning quiet this summer so far. Have you assigned youth teams/academies to your clubs? I think they are needed in order to produce any players. This is nothing short of heartbreaking. Hopefully the spate of racist incidents being reported in the media are just a knee jerk reaction to Brexit, but it just feels as if the right is on the rise not just in the UK but Europe as a whole. Wife convinced me to turn it off at half time to watch the game of thrones season finale. I don't regret that decision.